Robinsons Place Manila is an older Manila Mall, but it has everything you need. It was originally built in the 1980's and had a refurbishment in the late 90's. I like it because it is in the Ermita area and close to all the major hotels. What is good about Robinsons Place Manila? Robinsons Place in Manila is nice and easy to get to and easy to get around once your inside, don't be put off by the security guards on the door, there are security guards everywhere in Manila. Make sure you enter through the correct side of the door, it can be embarrasing trying to get through the door where everyone is exiting! They have a good food court, plenty of designer labels, internet cafe, you name it, it's all here. Where is Robinsons Place Manila? 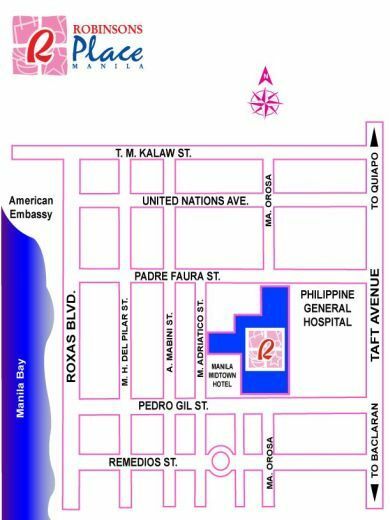 You will find Robinson's Place Manila in the Ermita district. It is on the block between Padre Faura Street and Pedro Gill Street and fronts Adriatico Street. How do I get to Robinsons Place Manila? This is the easy part, jump in a taxi, make sure they put on the meter, and simply ask to go to Robinsons Place in Ermita. If the taxi driver looks at you with a stange expression, jump out and get another. All taxis know where Robinsonf Shopping Mall is. Have a look at the short video below, it was taken on the ground floor of the Shopping Centre and no this is not a particularly busy day, kind of normal. What sort of shops are in Robinsons Place Manila? You have them all here. Everything you want, what you do not have is the upmarket top end brand stores. For novelty value check out Guns for the Good Guys on level 3. As it sounds it is a retail store selling guns, go and have a look.